POOL SEASON IS COMING. HOW ARE YOU REACHING YOUR CUSTOMERS? Our goal is to pass along that benefit to you, helping you drive your brand and message forward with the key prospects you are looking to reach. 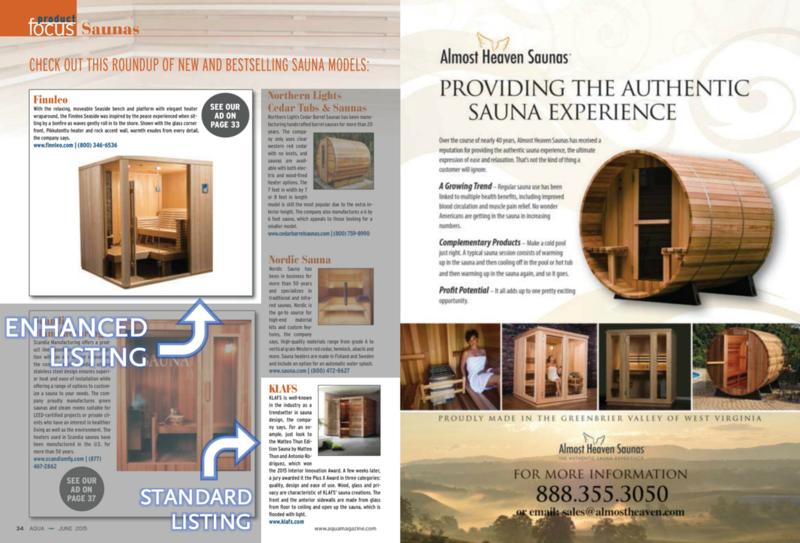 This June is no different, including editorial features on Swim Spas/Aquatic Exercise Equipment, Chemicals, Business Software Products and Outdoor Living. Plus, we're rolling out our first-ever Water Testing Product Focus! ​High-quality content and engaged readers, plus our proven print, digital and social media marketing results, provides an even greater reason why AQUA should be a vital part of your marketing strategy in 2017. DON'T MISS OUT – SECURE YOUR AD SPACE TODAY! These topics come at a great time because homeowners frequently visit their local pool stores in the summer. They often like to try new chemicals or save on the chemicals they’re already buying, and offering aquatic exercise equipment is a huge selling point for additional sales opportunities while they're in the store. Plus, they’ll be looking to ensure that they’re equipped with the know-how to employ their business software products throughout the busy months of summer. Our 15,000 audited print subscribers and thousands of AQUAmagazine.com visitors will look to this issue to learn what other pool professionals are planning for this summer and find the products that can make a difference to their bottom line – make sure they can find you among the pages of this jam-packed issue! Our first-ever water testing Product Focus is just time for pool season. As our dedicated audience of pool and spa professionals begin opening pools for the season, they’ll look to AQUA Magazine to inform them on the latest and greatest products the industry has to offer. Inclusion in this section is free to all industry companies.